In 2006, the author found the newly released Richard Dawkins’ book, The God Delusion at the library. Shaking his head in disbelief that anyone could think there is no God, he felt God impressing him to go through the book, writing what he thought would be a rebuttal, point by point. Both the author and his wife found Dawkins' words to be full of arrogance, often foolish sounding from the Christian point of view and predictably closed-minded. Yet, the author yearned to understand the mindset of such a man as Dawkins and had a deep burden in his heart for Dawkins’ soul. This work is a journal of the thoughts and emotions of the author as he endured the painful and frustrating process of toiling through The God Delusion. Though it was originally meant to be a rebuttal to The God Delusion, the author quickly realized there are brilliant Christian apologists and sharp men and women in Dawkins’ own field who are far more adept at arguing on Dawkins’ level. So the author found himself leaning more toward putting Christian principles into practice as a far better way of reaching atheists. If the book seems contradictory in message, it is because that was often the frame of mind of the author as he went through Dawkins’ book, which he felt was offensive and disrespectful toward Christians. The God Delusion took the author on a roller coaster ride where he was torn between anger at Dawkins' words and love for his soul. 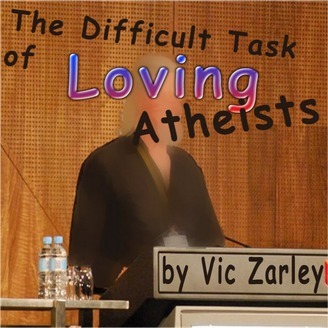 Hence the title, The Difficult Task of Loving Atheists. 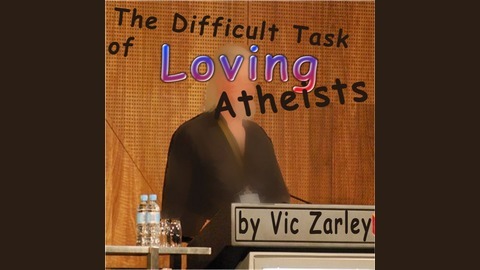 Produced and narrated by Vic Zarley. Special thanks to Kevin Macleod for the theme music, "Netherworld Shanty". This is Vic Zarley. This selection is just one of many Christian themed books I have either produced, narrated or written. I want you to hear them all! Go to the Podiobooks.com home page and key my name into the search field in the upper right-hand corner and click GO for the list. God bless you!